The men who stoned a couple to death in north Afghanistan will be brought to justice, say officials, after footage of the killings came to light. The man and woman were accused of adultery in the district of Dashte Archi in Kunduz province last August. Hundreds of people attended the stoning but no-one was charged. The area is still under Taliban control. After viewing the footage, regional police chief Gen Daoud Daoud said those responsible could be recognised. "Special police investigators will be sent there, we will find them and they will be brought to justice," he told the BBC. A mobile phone recording of the killings has only just been seen by Afghan and Nato officials. Most of the video is too graphic to be shown. 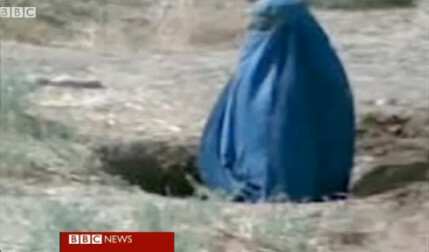 The video begins with Siddqa, a 25-year-old woman, standing waist-deep in a hole in the ground. She is entirely hidden in a blue burka. Hundreds of men from the village are gathered as two mullahs pass sentence. As Taliban fighters look on, the sentence is passed and she is found guilty of adultery. The stoning lasts two minutes. Hundreds of rocks - some larger than a man's fist - are thrown at her head and body. She tries to crawl out of the hole, but is beaten back by the stones. A boulder is then thrown at her head, her burka is soaked in blood, and she collapses inside the hole. Incredibly Siddqa was still alive. The mullahs are heard saying she should be left alone. But a Taliban fighter steps forward with a rifle and she is shot three times. Then her lover, Khayyam, is brought to the crowd. His hands are tied behind his back. Before he is blindfolded he looks into the mobile phone camera. He appears defiant. The attack on him is even more ferocious. His body, lying face down, jerks as the rocks meet their target. He is heard to be crying, but is soon silent. The couple had earlier eloped to Pakistan, but were lured back with the false promise that they would not be harmed. Taliban spokesman Zabiullah Mujahid defended the sentencing. In a telephone interview he said: "Anyone who knows about Islam knows that stoning is in the Koran, and that it is Islamic law. "There are people who call it inhuman - but in doing so they insult the Prophet. They want to bring foreign thinking to this country." Nato's senior civilian representative, Mark Sedwill, said the Taliban had an "appalling" view of Islamic justice. 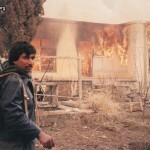 But he said the Afghan government needed to improve the rule of law in the country. "Communities that are terrorised don't have choices… that's why we have to remove the Taliban in these communities," he said. "It is absolutely critical that the Afghan government competes head-on with the Taliban in this area - the rule of law - so that people don't face the kind of choice that this community faced." Ahmed Nader Nadery, of the Afghanistan Independent Human Rights Commission, watched the video in full. He said it brought back memories of when the Taliban ruled the country. "It not only reminded me of those days in Kabul and other parts of the country, but it created a feeling of fear, and of further hatred of this group. And a fear - what if they return," he said. Mr Nadery added: "The Afghan government and the international community have failed to deal with these grave crimes. It happened at a time when there was a debate about the future of the international community, and discussions of their timeline for leaving the country." 21.05.2008: Taliban claim death of "female US spy"
Afghans with jobs, whether part-time or full-time, earn on average $410 per year  or about $1 per day, according to the World Bank.